Simple question, but have you asked yourself this lately? Have you taken time to really get clear about what you want in your life? This question matters daily - from smaller decisions about what you truly desire to eat on a daily basis to bigger questions about your relationships or career. The second week of our training, our yoga teacher training assistant taught one of the most beautiful, moving classes I have ever taken. I say this with great care and meaning because I've taken hundreds of classes in my life, yet, only a few have brought me to tears. The class was a moving meditation helping us connect to our hearts - to ask ourselves what we want and to trust that we are worthy and deserving of our deepest desires. I entered the class already feeling vulnerable after doing a lot of backbends the previous day - feeling the energy from releasing my heartspace. I didn't even quite realize what was happening until I ended up mid-way through the class in child's pose crying. I realized afterward that it's still very hard for me to be vulnerable when I tried to hide the tears and push through the class. I can laugh about it now - it didn't work, and I ended up back in child's pose, then an extra long savasana just soaking in my teacher's words and letting them settle into my body. I speak so much about listening to our bodies, our hearts, our intuition - it's there that so much incredible wisdom lies. Yet, I realized from journaling after that class that vulnerability is hard. I often lock away what I truly desire - from little things to bigger parts of my life - in my body out of fear. There's fear of speaking those truths to myself and acknowledging them. Fear of what others may think. Fear that my words or desires won't be valued in the world. Fear that I'm not worthy enough for what I want. Fear is so sneaky I didn't even realize how present it was in my life until that moment. Luckily, I was at a yoga training and was reminded to breathe. Some of it was only energy to be released from my body. We hold so much energy and old stories within our bodies, and through yoga, it has the potential to be released out. 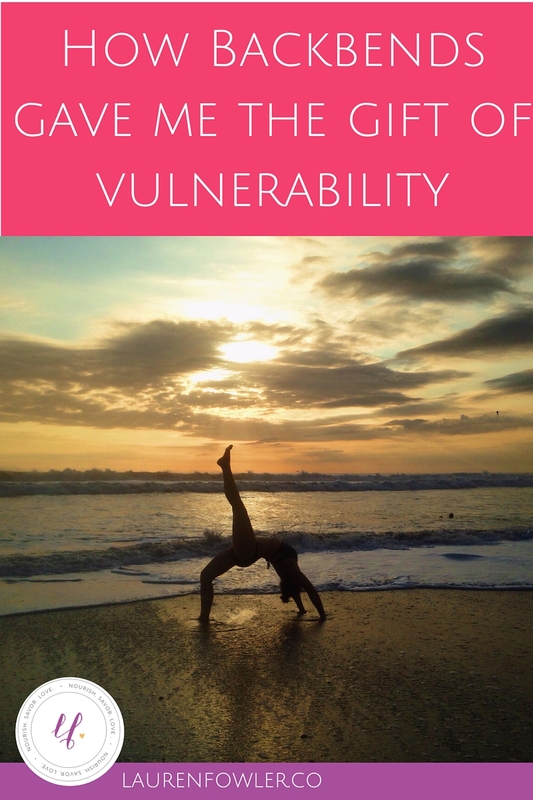 That class and days of backbends shone light on my heart to help me embrace a deeper layer of vulnerability. It's a lot easier for me to be vulnerable here with my words - yet, even that has taken time. Now, my work is to practice vulnerability with my voice in other ways. It feels scary as a naturally introverted person, yet also such a wonderful opportunity. In my cabin during the training, we created a sacred space to share anything and everything. To be heard and understood is a gift that should never be underestimated. 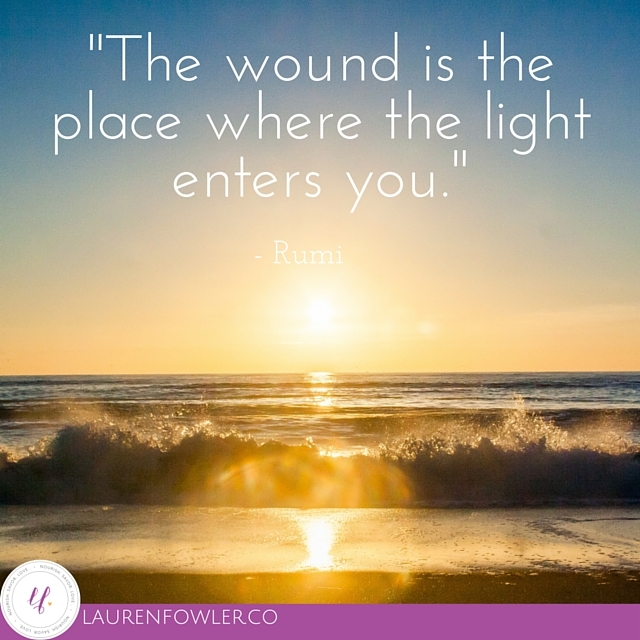 Coming back home this week, I've been so aware of these gifts and my continual practice of vulnerability and courage. Courage was my chosen 'word of the year,' and I'm realizing how perfect it was. The word courage comes from the root -cour, which means heart. Practicing courage is a heart-centered action. It doesn't have to be a grandiose action. For me, it's getting vulnerable, using my voice, speaking up for what I desire - starting with asking myself what I really want. I've already overcome a few fears by contacting people about a workshop I really wanted to run - and now, it's coming into fruition. Backbends used to make me feel extremely anxious and uncomfortable - after all, they are a physically vulnerable position. Your heart and throat are wide open to the world, which for me felt terrifying at times. Yet, now these are poses that I crave. They make me feel beautiful and allow my heart to shine open. The opening my yoga practice offers me carries into my life, where I can learn to live my life vulnerably with an open heart. To listen to and trust my heart. To honor what I truly desire - and practice the courage to go for it. To know that I am worthy and deserving of all my desires. Start today. Ask yourself - right now - what you want. You are worthy of all your desires.